In 1789, King Chongjo, ruler of the Yi dynasty, ordered General Yi Duk-moo to compile an official textbook on all martial art forms then present in Korea to preserve them for future generations. The result, the "Muye Dobo Tongji", is the only surviving classical text on the Korean arts of war. Based on the earliest known Korean martial arts treatise, the "Muye Chebo" written in 1599, the "Muye Dobo Tongji" clearly shows the influence of the neighbouring Japanese and Chinese armies. Through hundreds of wars and invasions, Korean soldiers adapted battlefield skills and tactics from their enemies, creating a unique system of their own. Organised into 24 distinct disciplines comprised of empty hand fighting, weaponry and horsemanship, this book is an accurate historical snapshot of the warrior arts of the hermit kingdom in the late 18th century. 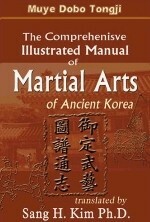 The release of "The Comprehensive Illustrated Manual of Martial Arts of Ancient Korea" marks the first time this volume is available in English. Carefully translated from the original text and illustrated with reproductions of ancient woodblock carvings, this book provides fascinating insights into Korea's martial arts legacy. Weiterführende Links zu "Muye Dobo Tongji"
Unser Kommentar zu "Muye Dobo Tongji"
Kundenbewertungen für "Muye Dobo Tongji"